The sock above is the Tern sock by Pam Allen I mentioned earlier. 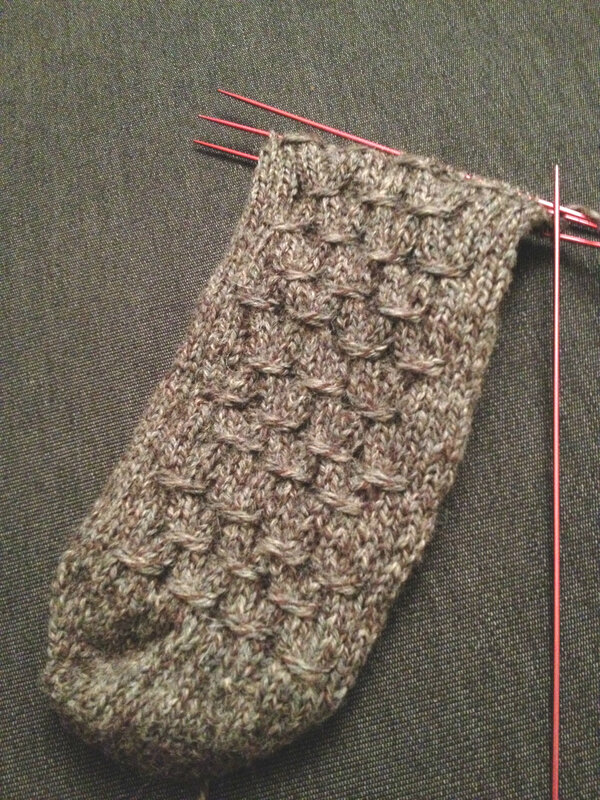 I’ve just reached the heel portion of the pattern, and I’m excited to see what happens next. Granted I have limited sock experience, this sock has a different kind of construction than what I’m used to. I usually cling to my gusset standby, but there were no increases before the heel on this one. I checked several times. I’ll probably check several more just to be sure. I could be wrong, which won’t bother me that much. The pattern is very easy to follow once you get the hang of the smocking, which makes it great for chilling out with. Once I got a rhythm going, I didn’t have to look at the pattern anymore until I knew I was at the heel. I’m really enjoying it so far. And the yarn! I think this yarn was made for these socks. I also found out what it was, despite the label disappearing. It’s Patons Glencheck Kroy Sock Yarn. Not super soft, but super cushy. I expect these socks will be very comfy. Oh, and the adventurous cooking is going quite well, better than expected actually. Turns out I don’t hate squash like I thought I did. Monday I had spaghetti squash both plain and then with a little bit of spaghetti sauce on it. It was excellent both ways. Tuesday husband and I went out, so I didn’t try anything that day. Yesterday, though, was really interesting. This is how little I actually know about vegetables, squash in particular. I thought I had bought acorn squash. That’s what the grocery store labels seemed to be saying. What I brought home, though, was something called chayote squash. It’s this gorgeous, light little vegetable that smells a little like a green apple. To me, it tasted like a cucumber and an apple had a mild tasting offspring. It was so good. I ate the thing raw with some fish on the side. Tonight’s menu is butternut squash, and yes, it really is that.